Learn Italian in just 15 minutes a day with this revolutionary language learning system, now with a free app. 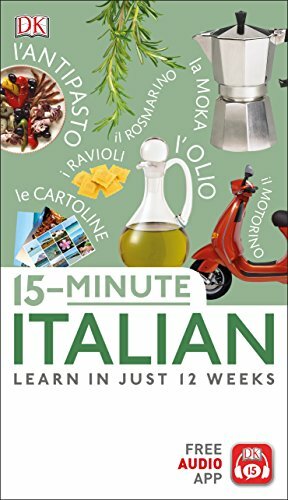 Practicing your language skills is quick, easy, and fun with 15-Minute Italian. There's no homework. Instead, use the visual guide and the free app to test yourself as you learn. Perfect your pronunciation by listening to native speakers, and learn from real-life examples that cover every holiday and business situation. Each full-color course book has themed chapters and common everyday scenarios, a menu guide, and translation dictionaries. Whether you're just starting to learn Italian or you want to brush up, there's no easier way to learn.